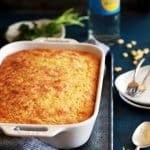 This eight ingredient Southwest Green Chile Corn Casserole is a perfect side dish option for nearly every occasion and couldn’t be easier. Cumin and diced green chiles stud this velvety, comforting dish that’s full of Monterey Jack cheese. 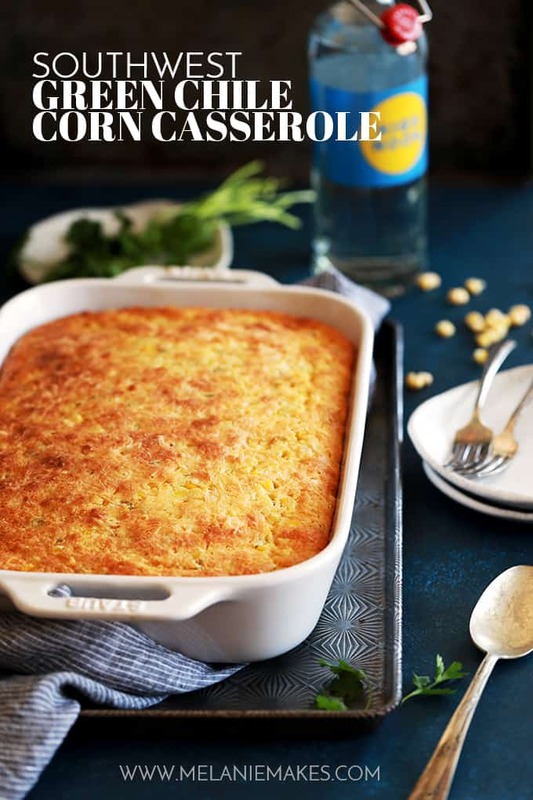 This Southwest Green Chile Corn Casserole is a kicked up version of my crazy popular Cheesy Corn Casserole that so many of you love. It’s the side dish that makes an appearance at our dining room table each and every time we throw something on the grill. Not only is it insanely easy, but it’s velvety texture also makes this comfort food absolutely addictive. 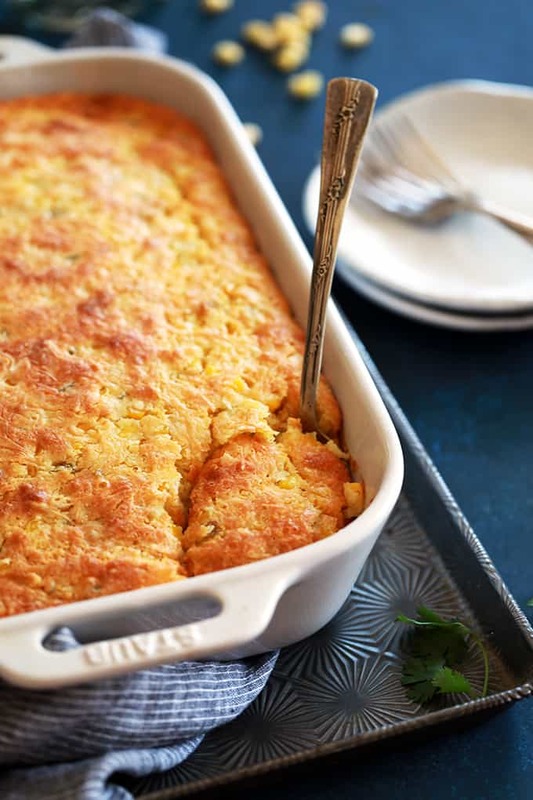 Unlike the original recipe, this Southwest Green Chile Corn Casserole has a few added ingredients. Cumin and diced green chiles make an appearance and instead of cheddar cheese, Monterey Jack cheese is the cheese of choice. Lest you think this is a spicy side dish, think again. Instead, it’s more of a mild and smoky flavor. If you can eat only one serving, I bow to your self control. I’m already envisioning my next summer gathering menu. Close your eyes. Let me take you there. 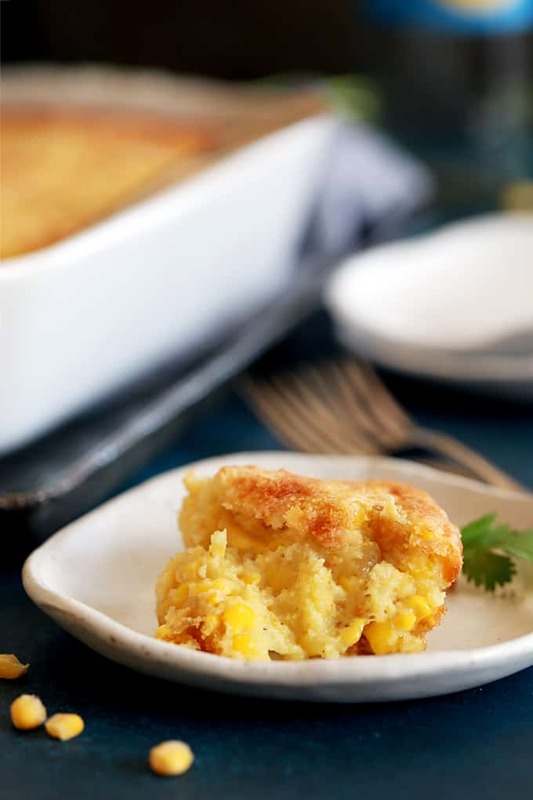 How about my warm weather favorite Honey Ginger Glazed Pork Tenderloin and Peaches served alongside my dreamy Loaded Scalloped Potatoes and this eight ingredient Southwest Green Chile Corn Casserole. Oh yeah. I’ve got this summer vacation thing down. Grab your phone. I’ll be shooting you a text to invite you over any minute now. Pour batter into greased 9x13 casserole dish. Bake for 60-70 minutes or until golden brown and set. 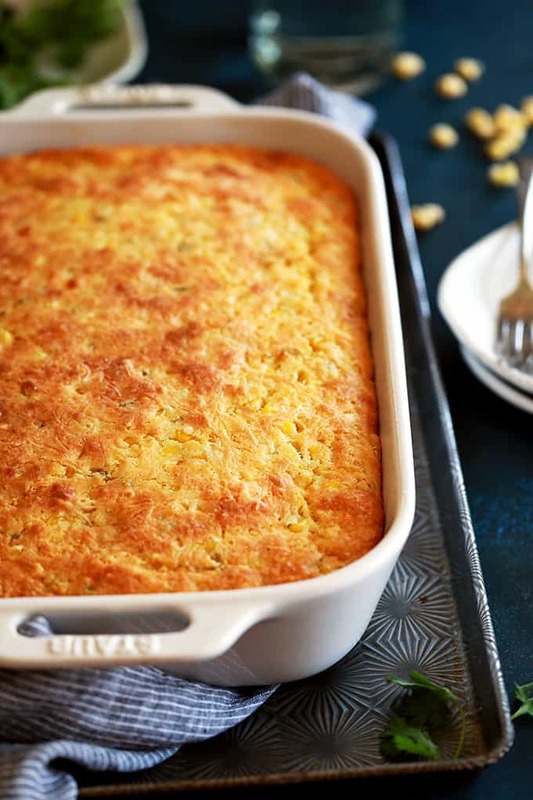 Looking for more ways to serve that summer staple of corn? 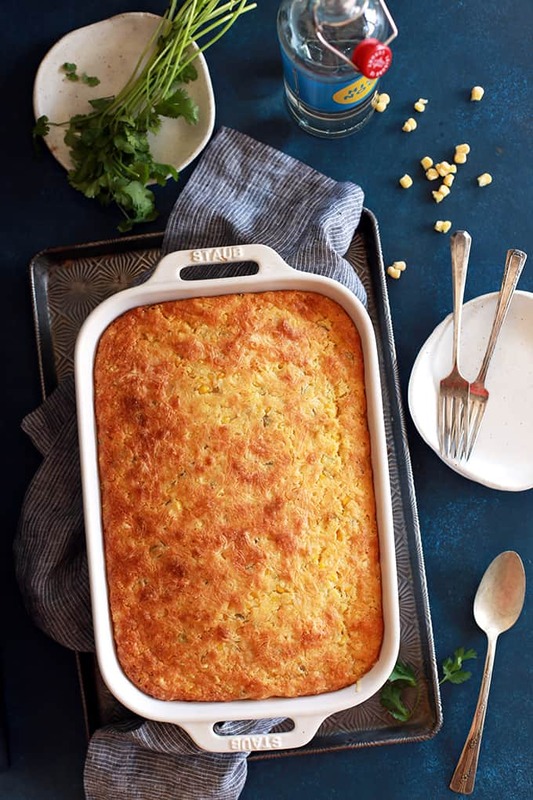 You’ll love this super quick Instant Pot Garlic Parmesan Corn on the Cob Recipe, irresistible Cheddar Corn Fritters and this party favorite Lightened Up Easy Hot Corn Dip. Made this for a Thanksgiving side dish and I was a big hit. Due to the limited oven space I made it in the morning and simply reheated it in the oven as the turkey rested. I found Hatch fire roasted chilis which added a super zip to the recipe. This is a keeper. Thrilled that this recipe was a part of your holiday and that you took the time to let me know you enjoyed it, Lorrie. Thank you! Is it 1 and 1/2 cups of oil and cheese. Or just 1/2 cup of oil and cheese?! Thank you! Hey, Jenny! It's 1-1/2 cups of BOTH the oil and the cheese. Hope that helps! Is it 1/2 cup of oil? Or 1 and 1/2 cups of oil. I wasn’t certain and thought that 1 and 1/2 is a lot of oil but I obviously don’t want to put too little. Thank you! Hi, Jenny - It's 1 and a 1/2 cups vegetable oil. Hope that helps! Do you think it would be okay to make ahead of time and bake the next day? Trying to make Father's Day less hectic! Hey, Susan - Honestly it's so easy as you're just stirring together a few ingredients that I'd wait until the day of as I haven't made it ahead before. Hope you have a great day! This will quickly become a favorite in my house! Looks SO good! Hope you give it a try, Toni! The addition of green chiles to this dish sounds amazing! Such a great flavor combination! It's such a great twist! Yum, looks so good! I need to make this soon! Oh I love the addition of chiles! What incredible flavor it adds. I am making this to serve on our next taco night. Love the way you think, Kristen!